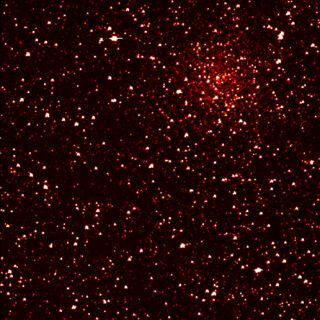 The puzzling star cluster NGC 6791 is visible in this image from NASA's planet-hunting Kepler spacecraft. An oddball conglomeration of stars called NGC 6791 represents an entirely new class of star cluster, a new study suggests. For decades, scientists have recognized two distinct types of star cluster in our Milky Way galaxy. Globular clusters are extremely old groups of stars tightly bound to each other by gravity and lacking in elements heavier than helium (which scientists refer to as "metals"). Open clusters, on the other hand, are much younger, more loosely bound and more metal-rich. NGC 6791, however, doesn't fit into this simple dichotomy. It shares characteristics of both types, making it a strange sort of hybrid, according to the study. "NGC 6791 is a real oddball among about 2,000 known open and globular star clusters in the Milky Way and as such provides a new challenge and a new opportunity to our understanding of how stars form and evolve," said study lead author Imants Platais, of Johns Hopkins University, in a statement. These stellar bits then become the raw materials for future generations of stars, which as a result incorporate more metals into their burning bodies. So old stars, and old clusters, should be relatively metal-poor, because they formed before space was enriched with metals. NCG 6791 has puzzled astronomers for years, because it doesn't fit this stereotype neatly. The cluster, which is about 13,000 light-years from Earth in the constellation Lyra, is about 8 billion years old — pretty old as clusters go. But its stars tend to be very metal-rich, boasting more than twice the metallicity of our sun, which is just 4.6 billion years old. Platais and his team, intrigued by these mysteries, decided to try to understand NGC 6791 a little bit better. The researchers studied the motions of nearly 60,000 stars in and around NGC 6791, using telescopes in Arizona and Hawaii. They found that the cluster contains several bright stars apparently belonging to the so-called classical horizontal branch: stars that are normally found only in globular clusters significantly older than NGC 6791. However, NGC 6791 also contains both red and very blue horizontal branch stars, which is not a typical trait of globular clusters. So astronomers don't quite know what to call NGC 6791. It's metal-rich, yet old; it contains some stars associated with globular clusters and some more often found in open clusters. It therefore appears to be the first known example of a third class of cluster, researchers said — one that can be thought of as a sort of hybrid of the other two. The researchers reported their results in the May 20 issue of Astrophysical Journal Letters.